Jeff Newman is professor of Biblical Counseling at Faith Baptist Bible College and Theological Seminary. This book is for those who are going through deep waters and need to know how to find encouragement in God during those times. Dr. Newman takes the reader through many personal stories and experiences and finds the solutions in David’s life as he wrote Psalm 63, and also by the example of Jesus Christ as He displayed those principles in His own life. Throughout the book he gives the reader assignments and graphic helps that allow him to write down important information as he reads through the book. The important benefit of this book is that it directs a hurting believer to the Scripture and to the example of Christ for answers and comfort. 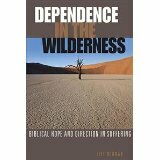 It does not use therapeutic formulas that simply sooth the conscience, but makes the reader face the real issues of sin, trust, obedience, and faith. This will be a help for any reader, whether as a hurting individual or a counseling friend, and it is a perfect recommendation for those in need. This is the kind of counseling book we need.